A note on images: photography isn’t allowed inside the Undressed exhibition, so the images featured here are a mix of press imagery and some snaps I took in the main fashion exhibition which is dotted throughout with a few lingerie and swim pieces. I have however linked to most of the pieces mentioned in the V&A image archive if you want to take a look. 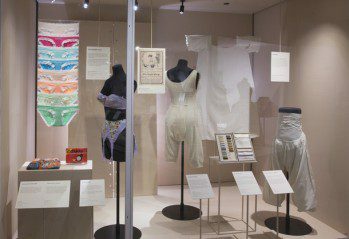 Yesterday I headed down to London for the opening day of the Victoria and Albert Museum’s newest exhibition, “Undressed, a Brief History of Underwear“. 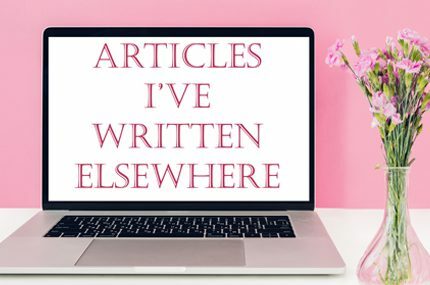 I’d been super excited about going since I first heard about the lingerie showcase, and I was up at the crack of dawn (quite literally) to hop on a coach and get there. 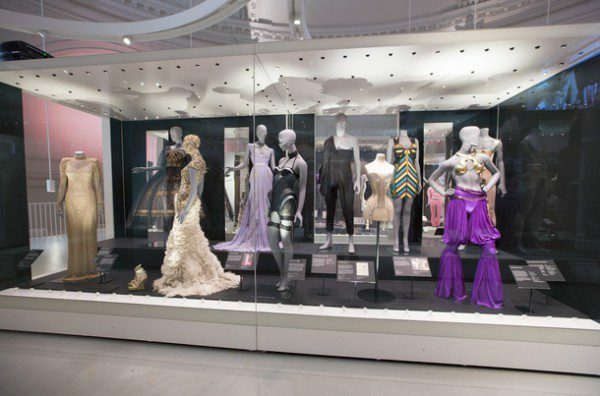 Undressed is split over two floors: downstairs you’ll find most of the antique pieces, split into themes such as Volume and Performance Wear, whilst upstairs the focus is much more on contemporary pieces and the way underwear has inspired outerwear fashions over the years. The first thing I spotted when I entered the exhibition was a pair of beautiful, embroidered silk stockings – men’s, it turned out – with ribbon-like garters to hold them up. There was a display case dedicated to garters further on, which explained that because these rarely-seen items were considered intimate, they’d sometimes feature personal or political messages in the design. There was also a display hidden away in a corner showcasing a selection of hosiery, and I instantly fell in love with a couple of pairs of opaque black stockings, one with floral embroidery and the other with a sequinned snake wrapped around the leg. They both looked like such modern designs that I was shocked to check the dates and see that both designs were from 1900! (I would totally wear those snake stockings today). Back at the start of the exhibition, around the corner from the men’s stockings are the first corsets, obviously a big part of any historial underwear exhibition. Here, there’s an incredible example of a working woman’s stays, densely packed with boning and weighing over 1kg – by contrast, I later saw a 1879 riding corset which weighed just 140g. This lightweight style, the text explained, was woven on a loom with pockets to insert the busk and bones, unlike typical corsets which are cut from many pieces of fabric that are then sewn together. It wasn’t just horseriding that women used to wear a corset for – there was also an advert for a sports ‘corset’ by Jaegar, which featured a bust supporter attached to a girdle-style bottom piece and an exposed midriff section in between. 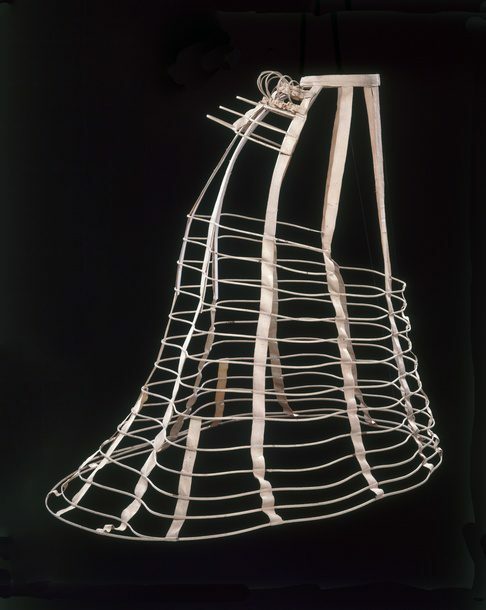 Other fascinating corsets included various styles designed to keep women cool in the heat, from mesh and ribbon corsets that are sometimes thought of as modern designs, through to corsets made from mosquito netting. 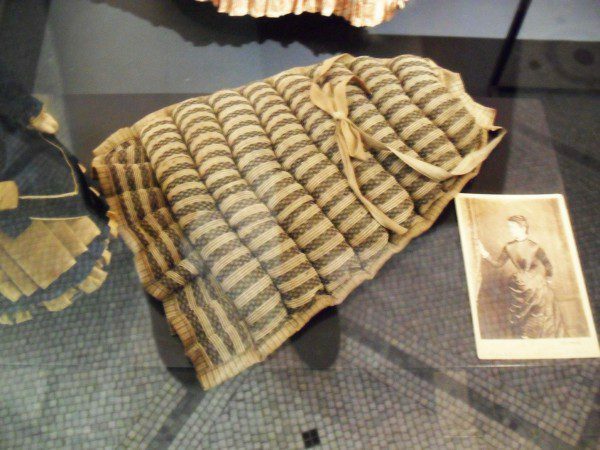 At the opposite end of the spectrum was a piece designed to keep women warm – a quilted petticoat stuffed with down, the thermal underwear of old! Undressed delved into the many ways that lingerie has been used to mold, sculpt and transform the female figure over the years. 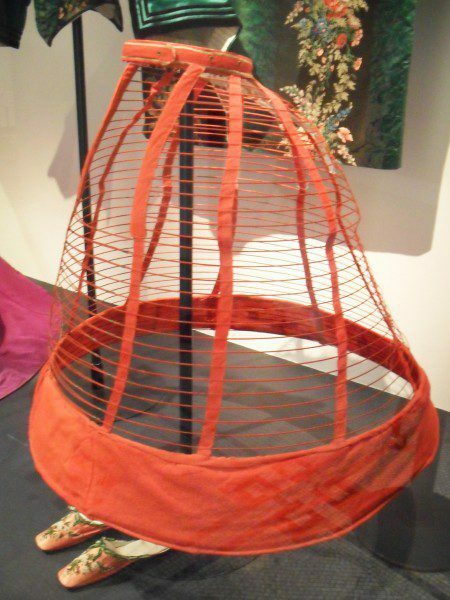 There were crinolines, cage-like garments designed to replace the wearing of multiple petticoats as a way to make sure skirts kept their wide shape. One crinoline from 1871 (pictured above) featured ripples which I’d assumed to be age-related damage but was in fact an intentional feature that ensured the skirt on top fell in graceful folds. 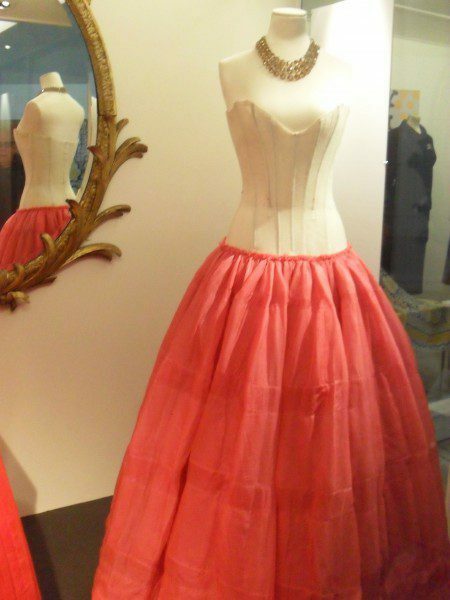 There were bustles, a 1913 Spirella Corset Company bust extender “for the person who is too thin or scant in chest development”, and an interesting pair of 1953 Weavamill knickers that were flat at the back but ruffled at the front to give the appearance of a slightly rounded tummy. Nowadays, that design would most likely be the opposite! Other pieces that caught my eye from the downstairs gallery were a spiral-knitted bra from 1928, a Thea Scott nightgown from the early fifties that reminded me very much of Kiss Me Deadly’s Elle robe, and a 1960s sheer mesh No Bra which could very easily have been a modern, indie-designer bralette. It was striking actually just how many of the older pieces could have been modern designs, trends definitely come back around. Upstairs, Undressed features a number of outerwear designs that have been inspired by underthings. 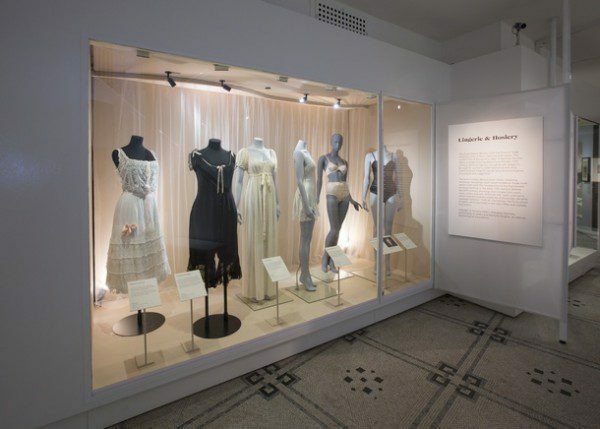 Mostly, it’s contemporary stuff, but there was also an example of an early 1800s dress made from sheer muslin that was designed to expose the clothing below – though what’s below would have been rather less revealing than the lingerie Kate Moss wore under her 1993 transparent Liza Bruce dress, also on show at the exhibition! We tend to think of lingerie-as-outerwear as a relatively new trend, but Undressed proved otherwise. 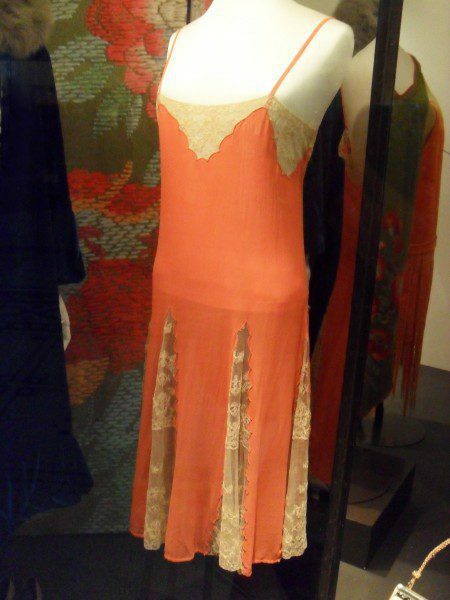 There was a pair of 1938 ‘dinner pyjamas’ for example – a silk velvet jumpsuit that looked like a crossover between a dress and a dressing gown – and Chinese silk pyjamas that became popular in the West in the 1910s and became fashionable to wear as outerwear instead of a tea gown in the 1920s. There was also a thickly-embroidered 1875 morning gown, a sort of formal dressing gown that some women wore to breakfast before they dressed properly. A Swarovski-crystal embellished Mr Pearl corset designed for Dita Von Teese. The Undressed exhibition ended on a modern note with a display showcasing some well-known current designers, such as Agent Provocateur and an adorable Babyloo playsuit by Fifi Chachnil – this is totally on my wishlist now! Fittingly, the very last piece I laid eyes on was a Carine Gilson robe as worn in Skyfall, ending my lingerie day out the same way it had started. If you’re thinking of going to the V&A’s Undressed exhibition, I definitely recommend it. It’s rather small (I’d allowed myself about 4 hours there but was out in under two), but full of fascinating little tid-bits for the lingerie addict. Unlike the surrounding fashion exhibition where most pieces are just dated, in Undressed there’s a little story behind every garment to read about and I learnt a lot whilst I was there. 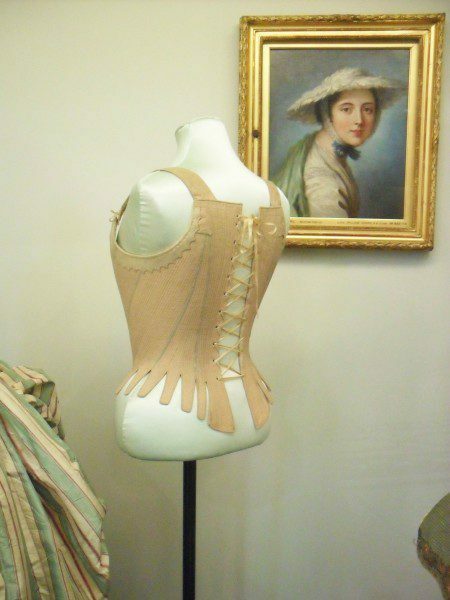 Undressed costs £12, though if you want to get even more out of your visit there are a handful of free and paid special events coming up such as a talk all about crinolines on April 27th. The exhibition will remain open for almost a year until March 2017, and you can buy tickets for it here. It was pretty packed by the time I left at 1pm which may just be due to it being opening day, but if you prefer to browse in peace and quiet I’d recommend booking for earlier. 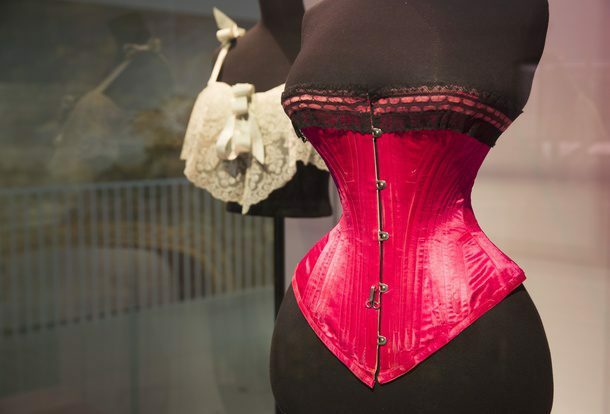 If you’ve been to the V&A’s Undressed exhibition, I’d love to know what you thought of it. And which piece pictured here is your favourite?